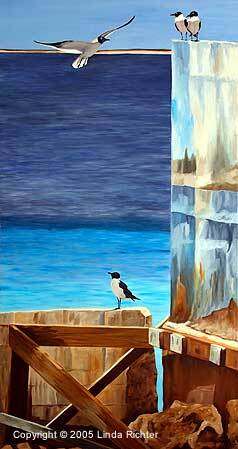 A companion piece to On the Edge, Blue Wall takes in the view at the horizon where gulls congregate. 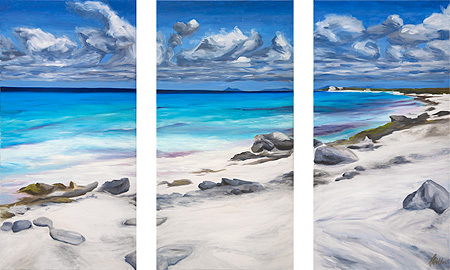 In the distance, a thin line of the uninhabited island of Klein Bonaire separates sea from sky. The colors of the sea are mimicked in the discolorations of the cement wall. 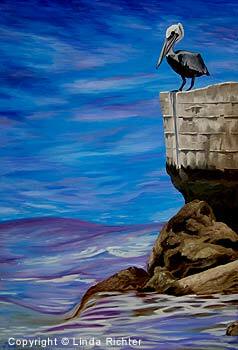 A pelican stands watch. Intent in its search for dinner swimming by, the pelican is prepared to lauch himself into the sky at a moment’s notice.